With this presentation of Ohio Wesleyan University’s Alumni Award, the Ohio Wesleyan Alumni Association Board of Directors is proud to recognize Michael G. Long for his tireless service and unending dedication to his alma mater. Mike earned his B.A. in 1966, majoring in Economics. He was President of the Gamma chapter of the Sigma Chi Fraternity and a member of the Interfraternity Council. He also was a member of the Varsity Soccer Team. Since his graduation, Mike been actively engaged with Ohio Wesleyan. He served on the Board of Trustees from 1996 to 2014, including as Vice Chair from 2007 to 2010 and as Chair from 2010 to 2014, when he became a Life Trustee. Mike, a retired partner and respected and accomplished litigator at Vorys, Sater, Seymour & Pease, also has served as University Counsel. In addition, Mike served on the Alumni Board from 1988 to 1994. He served as Chair of the Presidential Search Committee before the installation of Dr. Rock Jones as OWU’s 16th President in 2008. Mike has been a dedicated volunteer, serving as a Class Giving Chair, Annual Giving Fraternity Volunteer, Reunion Volunteer, and played a vital role leading his 50th reunion committee this year. He and his wife, Pamela Blazer Long, Class of 1966, are members of the Tower Society and have been members of the President’s Circle since 2008. 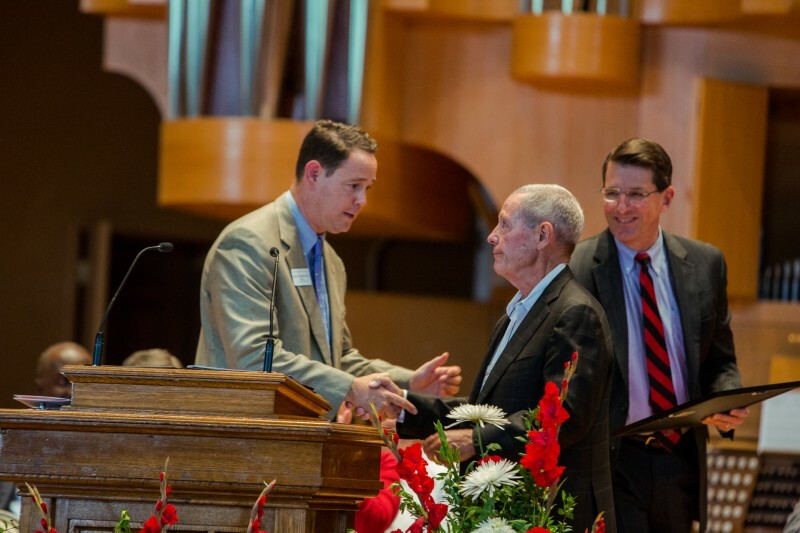 Today, during his Golden Reunion, we thank and applaud Michael G. Long for his longstanding and dedicated service to Ohio Wesleyan and the campus community.